Taking a drone on honeymoon Jump to media player A Japanese couple take documenting their honeymoon one step beyond selfies, by taking a drone along with them. Drone footage shows NZ whales from above Jump to media player Footage of Bryde's whales feeding has been caught on camera. Drone regulations 'need enforcing' Jump to media player Commercial drone sales are expected to almost double in 2016 - but is the industry properly regulated? Can a drone stop a plane? Jump to media player A British Airways passenger jet was reportedly hit by a drone yesterday as it was coming in to land at Heathrow Airport. From kissing on the beach to smug smiles over cocktails to holding-hand shadows, most couples will document their honeymoon with romantic selfies. 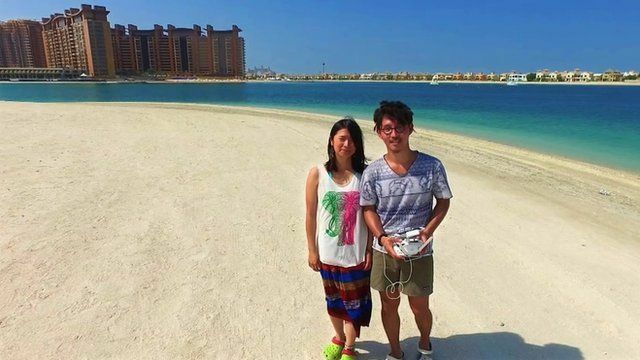 But Japanese newlyweds Kaz and Mariko, from Kyoto, took it one step further, by taking their drone with them on their round-the-world trip.